Today I had a profound encounter with the transforming power of the Lord Jesus Christ. Last July I wrote a post referencing a man who regularly slept on the front porch of our church. I hadn’t seen my friend in many months until today when he visited my office with a heavily bandaged face and right hand. My friend had been living and working on another island in The Bahamas when he had an accident. When lighting a fire to cook dinner, he inadvertently caused an explosion that launched him off the ground and temporarily took away his eyesight. As he recounted the story to me, the extensive burn marks on his face verified what he was saying. At first, you could only feel sorry for the man because of what he had endured. But soon it became apparent that this fire had, in a manner, saved my friend’s life. “I was blind, but now I see!”, he declared when entering my office. At first, I thought he was talking about his physical eyesight, but upon further reflection I think he was talking about his spiritual eyesight. “I’m Job–‘Though He slay me, I will hope in Him'” (Job 13:15). My friend shared how he was now reading his Bible every day and as I read some passages to encourage him, he insisted that I write down the references for him to look up later. He also thanked me for all that I had done for him, stood up and, with tears streaming down his face, gave me a hug. I don’t know that I did all that much for him—some meals, some clean clothes, some encouragement, but sometimes we would go for weeks without any meaningful exchange. At the end of the day, nothing I did brought about the transformation that I was witnessing. God did this. 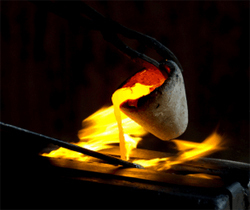 One of the metaphors for salvation used in the Bible is that of the refiner’s fire. Many congregations even sing a hymn by that title. Amazingly, in this instance, the Lord chose literal fire to transform and refine a man that He refused to let go. I am overjoyed that the word of the Lord, spoken through Zechariah, now applies to a man who once slept on our porch. This entry was posted in Following Christ, Grace / Mercy / Blessing, Pain and Suffering, Promoting Christ, Providence, Salvation, The Bahamas by Bryn. Bookmark the permalink. Awesome Bryn! God’s hand at work with a little help from a minister new to the island, who took notice, reached out and showed he cared! I think to print this and add it to the bulletin on Sunday would be a great way to ensure that everyone at the Kirk is witness to this miracle. Outstanding, Bryn. Praise God for his work in and through you and the Kirk! amazing how someone considered by many to be downcast and insignificant without insight, education or even intelligence would see this catastrophe as a second chance. How many of us, the so called blessed and fortunate ones get second chances and never see them as that. It takes the interpretation of a story like this to help us all see the miracle of even each day as our second chance. Life is good and great and even more wondeful when shared. Our friend has plans to return to work and live in Long Island once his treatments are complete. My hope is to connect him with Pastor Dan in order that he might have ongoing encouragement for his walk. Quick update on our friend—Ricardo attended worship at the Kirk the last 2 Sundays. His home and employment opportunities are on Long Island and so today we furnished Ricardo with a new Bible, some food, and a ticket on the boat to Long Island. Please pray that Ricardo continues to heal from his injuries, pray that he finds work, and that he continues to be nurtured in his renewed relationship with Christ. Thank you Margaret for being one of many at the Kirk who has extended kindness to Ricardo. I’d like to think that our collective support has helped to encourage him.